Kafka's Last Trial begins with Kafka's last instruction to his closest friend, Max Brod: to destroy all his remaining papers upon his death. But when the moment arrived in 1924, Brod could not bring himself to burn the unpublished works of the man he considered a literary genius--even a saint. Instead, Brod devoted his life to championing Kafka's writing, rescuing his legacy from obscurity and physical destruction. The story of Kafka's posthumous life is itself Kafkaesque. By the time of Brod's own death in Tel Aviv in 1968, Kafka's major works had been published, transforming the once little-known writer into a pillar of literary modernism. Yet Brod left a wealth of still-unpublished papers to his secretary, who sold some, held on to the rest, and then passed the bulk of them on to her daughters, who in turn refused to release them. An international legal battle erupted to determine which country could claim ownership of Kafka's work: Israel, where Kafka dreamed of living but never entered, or Germany, where Kafka's three sisters perished in the Holocaust? 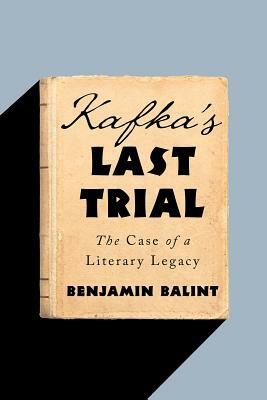 Benjamin Balint offers a gripping account of the controversial trial in Israeli courts--brimming with dilemmas legal, ethical, and political--that determined the fate of Kafka's manuscripts. Deeply informed, with sharply drawn portraits and a remarkable ability to evoke a time and place, Kafka's Last Trial is at once a brilliant biographical portrait of a literary genius, and the story of two countries whose national obsessions with overcoming the traumas of the past came to a head in a hotly contested trial for the right to claim the literary legacy of one of our modern masters.